Your favorite heels broke, traffic was horrific, you missed a deadline, and you have a splitting headache. But as you open the door you're greeted by a wagging tail, a meowing cat, a chirping bird, a thumping rabbit, or a beautiful fish. Pets can enrich your life so much and there's no greater feeling than the love of a pet. 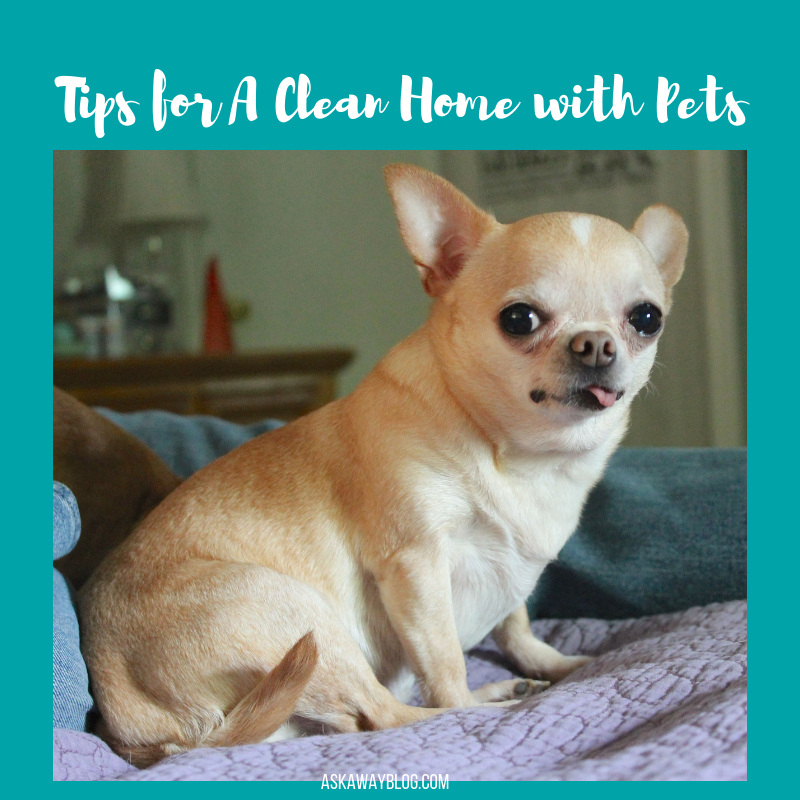 As an owner of 4 dogs, 2 rats, and 1 fish, I know a lot about balancing your pets with a clean and tidy home. And today, I'm going to give you some tips on how you can have a happy home with pets AND a clean one. This floor lamp is weighted down with a salt lamp so that it can't tip over if the dogs bump into it when they wrestle in t heir beds. 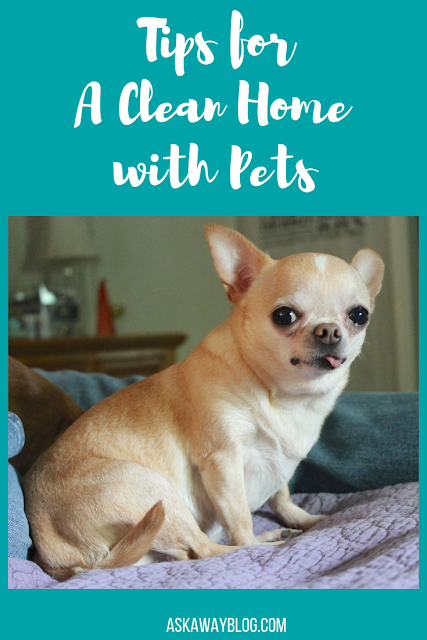 Just like you do with small children, you need to pet proof your home based on the size of your pet. For cats, they can be climbers and seem to have a favorite past time of knocking fragile items off even the highest shelf. If you can't keep ANY breakable decor out, you'll have to put it away. With dogs, make sure anything that can be chewed or broken or knocked down is up high way out of their reach. If you're lucky like me and you have a small breed dog this will be a heck of a lot easier for you since Chihuahuas can't really get up past the second shelf of a bookcase. An accident can happen at any time no matter who is in your home and what you're doing. To be prepared for the occasional vomit, urine, or poo accident, keep a stash of paper towels, carpet cleaner, and room spray in a central spot you can easily access in a rush. 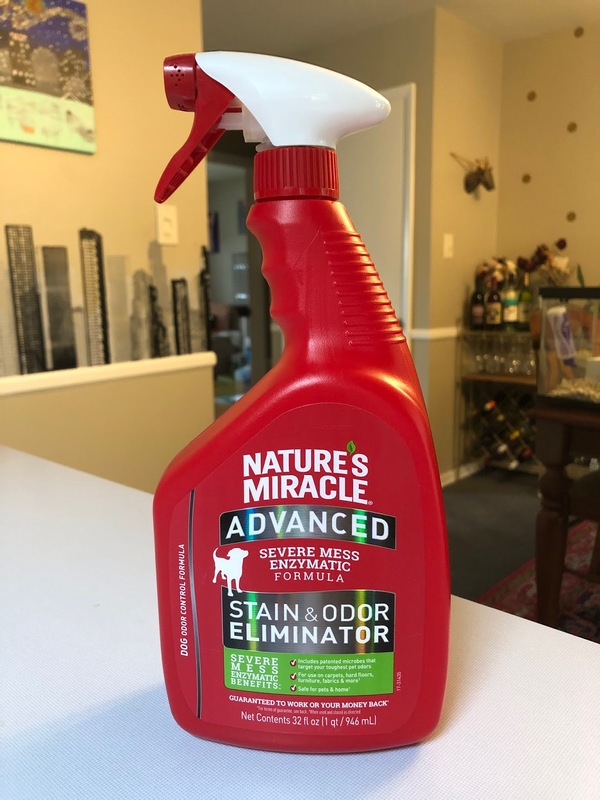 I like to use Nature's Miracle Advance Dog Stain & Odor Remover from Chewy. Not only does it clean up the current mess but it helps to prevent future re-soiling incidents in the same area by removing the odor. Dogs tend to have accidents in the same spot so this is really helpful to curb that behavior. You want a product like this, with a bacteria-based formula that makes enzymes to target even the most disgusting messes. You can use it on furniture, fabrics, hard floors, and carpets and it has a really pleasant scent that it leaves behind. So we all know how cats love to scratch and dogs always seem to vomit on furniture, which is why I highly recommend getting sofa covers for your furniture. I have an oddly shaped couch so I just use throw blankets which seems to do the trick because it's easier to wash them than to spot clean the sofa. If you have cats, make sure you provide them their own furniture to scratch and climb. Cat trees are a pretty neat thing and they really do allow cats to get their scratching instincts going. So we used to have an issue where every night Stella would sneak out of bed and she would pee in the living room. We fixed that issue by putting up a small gate to block off the living room when we sleep. That put an end to the behavior real quick. If there's a room you don't want your pets in, shut the door or put up a small baby gate. There are actually some pretty gates I've seen people use but we actually just use one that's meant to be a play pen for pets and when we aren't using it, we fold it up like an accordion and put it out of sight. 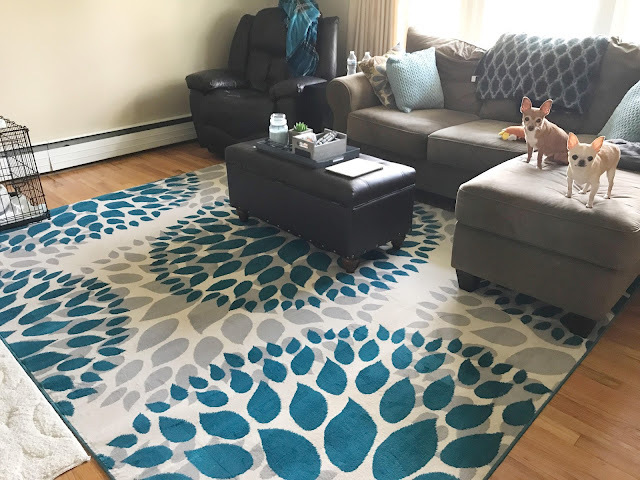 With a few tweaks, you can make your home and clean and pleasant environment not just for your family and guests but for your furry friends.